​Please park on the right side of the lot in the far back. Members will be available to direct you. All Democrats and progressives are invited to our meetings. Come and enjoy the company of like-minded women (men also welcome) of all ages and learn about issues important to our community, our state, and our country. Please note that only members will be able to vote on club business. **Please note this month's meeting is off schedule, on the 2nd Saturday! Join us for a timely meeting focusing on building awareness of sexual violence and human trafficking in our community. ​As you know, seating is limited so please bring a folding chair if possible. We are very excited to be able to host Carey Haughwout this Saturday. ​She is a Public Defender in Palm Beach County and President of the Florida Association of Public Defenders. Our community has been disproportionately impacted by the drug epidemics and mass incarcerations over the last two decades. As we move forward with our engagement in the community in Rights Restoration, this discussion gives us a broader understanding of the issues.....JOIN US!!!!! As you know, sometimes there is standing room only, so please bring a folding chair if you have one. Join us for a panel discussion on the School Support and Teacher Pay Voter Referendum! Voters in April will be asked to raise property taxes to helps the school district improve teacher pay, school security, student mental-health programs and school educational programs. This referendum will be held entirely as vote-by-mail so be on the look-out for your ballot in April! Join us as we look at our strengths, challenges, and the emerging issues in our community! Our guest speakers will be two of our newly elected officials. As we begin the new year, we will also begin collecting dues for 2019. Help us continue moving forward together by investing in the club and the important work we are doing in our community. Join us this Saturday as we look at our strengths, our challenges and the emerging issues as we move forward together. Our special guests will be newly elected officials, State Representative Delores Hogan Johnson and County Commissioner Sean Mitchell. December's meeting will be replaced with our Holiday Celebration! Join us as we celebrate the season of Light, Peace, and Love! We will install our new officers, honor the 2018 officers for their service and dedication, and provide a nice retrospective of our achievements this year. Please bring an unwrapped toy for the Guardian Ad Litem Program Toy Drive! ​​Join us for our election of officers this Saturday! At our meeting all members will be asked for a voice vote, as all of our candidates are running un-opposed. A short bio of each candidate will be provided prior to voting. The candidates will also have a few minutes to present their vision for the club. We've worked hard to make a blue wave happen and are encouraged by the results of our dedication, particularly here in St. Lucie County! I know we all are looking forward to continuing to move our community, this state and our nation FORWARD...TOGETHER!!!! ​Our October meeting will be very short. We will have postcards, phone calling turf and walking turf available for everyone. Our fundraising event has enabled us to fund GOTV activities with printing and postage. We will also have printed information you can hand out regarding the amendments and our slate of candidates. 1034 SE Port St Lucie Blvd (BRIDGE PLAZA - Corner of PSL Blvd and Westmoreland behind the McDonald's and Mobil gas station). We will have experienced folks to make calls or walk turf with and canvassing packets ready to go! We've reserved a table at Lefty's grill right next door to the headquarters so we can gab a quick lunch before working. With the primary behind us, we will be outlining our strategy for the General Election and how we will get our slate of wonderful Democratic Candidates elected. Additionally, there will be a breakout session for volunteers and signups for our Get Out The Vote actions. Everyone can contribute, whether it's door knocking, phone banking, or writing personalized postcards. Now more than ever, voters are becoming motivated to change the direction of our community, our state and our nation! 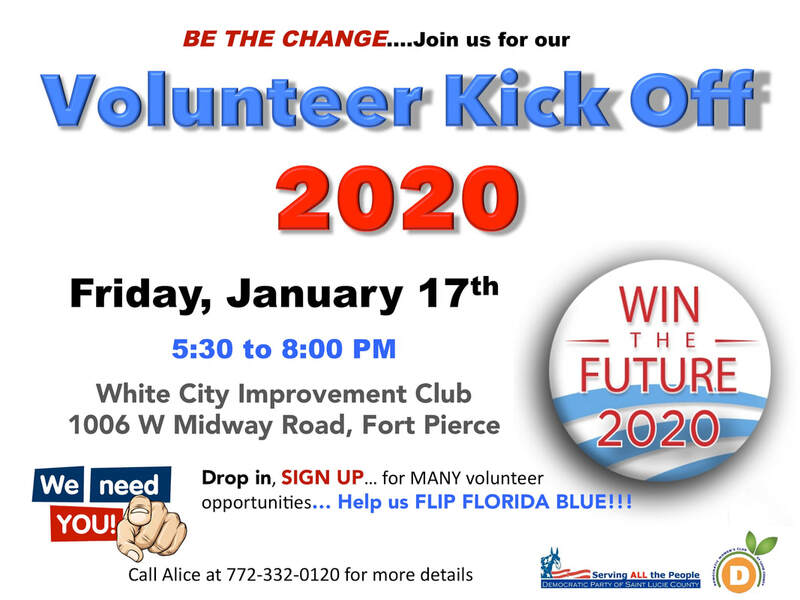 There is no time to waste and we need your help to flip FL Blue! We're pleased to have Chris King, candidate for Governor of the state of Florida. speak to us as well as our scheduled candidates forum on "The POWER of Education!" Don't miss this meeting. It will be packed, so please help us by bringing your own folding chair, if you have one! Please park way, way..way in the back of the dealership near the body shop. Lastly, come join Chris King for canvassing in Gifford with Nicole Haagenson immediately following the meeting. We will car pool and have a quick lunch on the way. Join us at our monthly meeting focusing on the POWER of Education! Followed by Discussion, Q & A, and a meet and greet with the local School Board Candidates: Debbie Hawley, Felicia Bruce, and Donna Mills. Join us to learn more about these great candidates! Join us for a discussion about education in St. Lucie County! At this month's meeting, our members that attended Tally Days in February will give us a full report on what they learned! We will also have a presentation by Bob Sciranko, DCCC District 18 Organizer.